The month of February marks a price increase for one of Massage-chair-relief.com’s most impressive and popular massage chairs, the Inada Sogno DreamWave. In February of 2012, the Inada company announced a price increase across their entire range, but this year it is only the Sogno DreamWave massage chair that incurred the increase. Previously $7799, the Inada Sogno DreamWave chair is now available to purchase at http://www.massage-chair-relief.com, as of February 1st, 2013, for $7999. But what are the features and functions of the DreamWave chair that make it worthy of another price increase and worthy of being one of the most expensive massage chairs available on the market today? Many of the features that make the Inada Sogno DreamWave massage chair a consistent best seller were actually created and patented by the Inada company and cannot be found on any other massage chair in the industry. Many massage chairs in the industry imitate and mirror their competitors, where as Inada innovate rather than follow. The DreamWave chair offers more massage coverage than any other chair available on the market. Over 1,200 square inches of chair cover the body and immerse the user in shiatsu relief. Part of that impressive coverage is provided by Inada’s patented Dream Wave technology. This technology enables the airbags under the upholstery of the chair seat to work in a figure-of-eight movement, mimicking the same movements a professional massage therapist would use during a shiatsu session. The shiatsu massage is diagnosed using optical scanning technology that locates a user’s unique acupressure points. Many of the competitors deliver a standard shiatsu massage therapy, disregarding an individual’s personal body shape or size. The DreamWave however, scans the body before therapy and the results are proven to be dramatically more effective for users of all sizes and shapes. The multi-faceted DreamWave chair was designed with more than one solitary user in mind. This is a chair for the entire family. Inada patented a setting for the DreamWave uniquely designed to cater for users 14 and up. This gentler setting allows growing bodies to benefit from the healing properties of a world-class massage. Another truly unique setting of the Inada Sogno DreamWave massage chair is the stretch program. It not only offers extension and flexion, but also gives a slight rotational pull to the shoulders, hips, and mid-back. This technology was designed for the user with a tight back as the rotational pull loosens the muscles in the back and offers relief to this commonly troublesome area. Other innovative and unique features of the chair include full arm airbag massage, the Cervical Tracion Device (a headpiece that utilizes airbags to massage the neck muscles and the trapezia muscles...the only one of it's kind on the market), airbags to massage the IlioTibial Bands, and waist airbags that induce rotation of the low back. 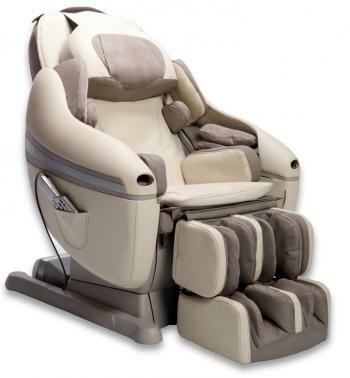 The designer of the Inada Sogno DreamWave massage chair is the world-renowned Toshiyuki Kita. Kita’s work has earned a permanent place in the Pinakothek der Modarne in Munich, the Centre Georges Pompidou in Paris, and The Museum of Modern Art in New York. The experience and eye of Kita shines through the DreamWave massage chair, and esthetically, he has designed a graceful and stylish chair that tastefully incorporates the latest state-of-the-art technology without compromising on the visual appeal of the chair. Beyond the myriad of impressive features of the DreamWave, it should also be noted that the Inada range of chairs have a near-zero failure rate and provide among the most comprehensive massage chair warranty available in the industry. To learn more about the impressive Inada Sogno DreamWave massage chair, contact Dr. Alan Weidner, founder and CEO of massage-chair-relief.com personally on 801-417-8240 or visit http://www.massage-chair-relief.com/massage-chairs/inada/inada-sogno-dreamwave/ for more information.